It was great to get back on stage after taking the summer off. Like the song by Supertramp, “When you’re up on the stage, it’s unbelievable.” But even so, I return to my office up there knowing that some folks in the audience will hear my message, and will recoil in fear rather than generate ideas. The future is a scary thing, particularly when it involves massive business model disruption, significant new competitive challenges and more. I know there are folks in the audience who will fall into the mindset observed by Ogden Nash: “Progress is great but its gone on way too long!” And there’s the rub – while they might not like the speed fo change, they have a choice as to whether they want to participate in it or not. If they don’t align to future trends, they will find that other people have, and will have done the right things to turn the future into opportunity! These folks will be left behind. We’ve seen it before. Industries that fail to reinvent. People who find their skills irrelevant because they did not choose to retrain. Business models obliterated by those who dared to do it differently. Products that go to of date because someone had a better idea. 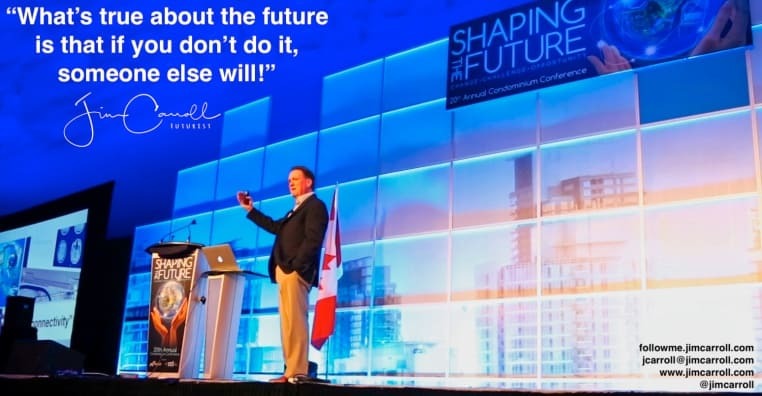 Do this today – choose to be a part of the future, not a relic of the past!